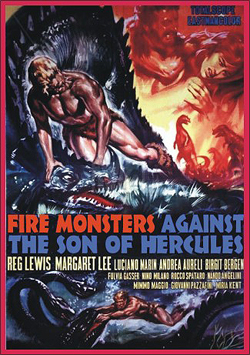 (1962, aka Maciste against the Monsters) Reg Lewis, Margaret Lee, Luciano Marin. Before they changed his name to Maxxus for a Son of Hercules film, this movie was about Maciste, who stumbles upon two warring tribes: Sun worshipers and Moon worshipers. He saves the Sun worshipper’s leader from a monster and falls for lusty Margaret Lee, who’s taken by the Moon worshipers. Maciste of course comes to her rescue, battling villains and monsters along the way. Great color, widescreen, 35mm.